Figure 1. The Virtual Fly Brain beta website. Click on Show all Domains to view the controlled vocabulary displayed down the right-hand side of the page. This past December I wrote “I’d love to be able to use a virtual fly nervous system” (see How the Brain Works, Flies, and the FlyBase Online Data Repository). A week ago David Osumi-Sutherland from the FlyBase Consortium posted a response that “A beta version of Virtual Fly Brain is now live” (see Figure 1 above). In that previous blog post one of my questions was where the supraesophageal ganglion was located in the fly brain. I got a verbal description but no visual help. In the Virtual Fly Brain the supraesophageal ganglion is listed in the controlled vocabulary under Anatomy Tree and Search along the right-hand side of the page. 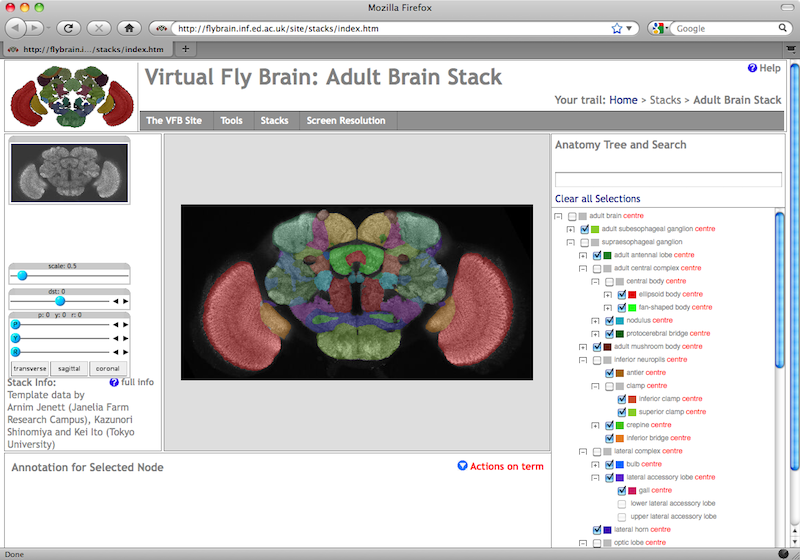 Note: The Virtual Fly Brain page may display “Show all Domains” rather than list the anatomy terms. Click on “Show all Domains” to display the anatomy terms down the right-hand side of the page under the “Anatomy Tree and Search” heading. Figure 2. The supraesophageal ganglion includes the colorized area shown in in the fly brain displayed by the Virtual Fly Brain website. To highlight the supraesophageal ganglion in the fly brain image, first click on Clear all Selections to remove the terms that are selected by default. Next, click the check box to the left of the supraesophageal ganglion listing in the anatomy tree. The area defined as the supraesophageal ganglion fills with a transparent color shown in the little box to the right of the check box. The anatomy listing is a display of the Drosophila Brain anatomy ontology, which was developed using OWL2. The ontology provides a means to interlink fly anatomy with innumerable pieces of data. I look forward to exploring more of this promising tool as it develops. This entry was posted in Brain Science and tagged Brain Science, Open Data Repositories, Semantic Web on April 16, 2011 by Donald Doherty.